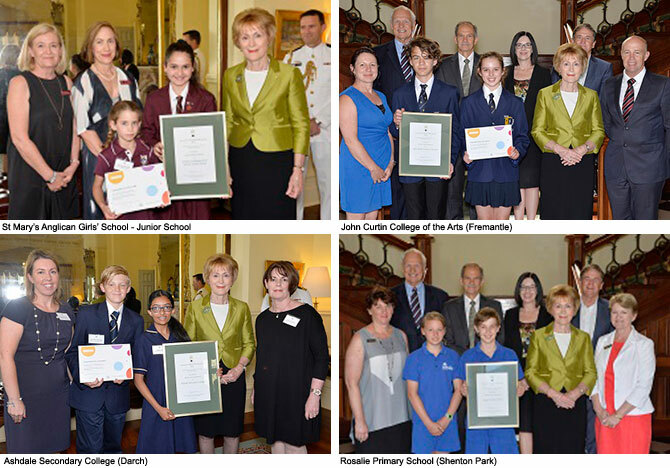 The importance of STEM education was emphasised in an awards ceremony when Her Excellency the Honourable Kerry Sanderson AC, Governor of Western Australia, announced the winners of the 2016 Governor’s School STEM Awards at a ceremony held at Government House on Thursday, 24 November 2016. The presentation ceremony was attended by representatives from the ten finalist schools, and leaders in education. The Awards, now in their second year, recognise the support and commitment of school principals and leadership teams in developing their schools' science, technology, engineering and mathematics (STEM) education programs. The Governor is a great supporter of STEM education, having completed a Bachelor of Science with a double major in mathematics. The Awards are delivered by a coordinating committee led by the Office of Science within the Department of the Premier and Cabinet, with representatives from the Department of Education, Catholic Education Western Australia, the Association of Independent Schools, the School Curriculum and Standards Authority, the Science Teachers Association of Western Australia, the Mathematical Association of Western Australia, and Scitech. The Governor thanked the committee members and the independent judges for their support in the awards. For more information contact Emma Veenema, Office of Science on 6552 5753 or emma.veenema@dpc.wa.gov.au.